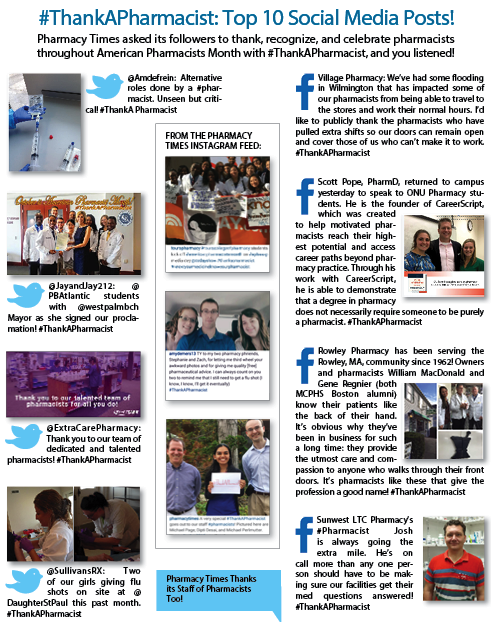 PLAINSBORO, N.J. (November 1, 2016) - Pharmacy Times®, the leading media resource for pharmacists and the pharmacy industry, celebrated American Pharmacists Month (APhM) last month by again leading a nationwide #ThankAPharmacist social media campaign. Recognizing thousands of pharmacists through its Twitter, Facebook, LinkedIn and Instagram channels, Pharmacy Times® outreach helped to bring broader awareness to the profession and emphasize the value of the pharmacist. Sponsored by the American Pharmacists Association, the goal of APhM is to advocate for the pharmacy profession and generate recognition for pharmacists among their peers, patients and communities. During APhM, Pharmacy Times® asked its followers to thank, recognize and celebrate pharmacists through social media with #ThankAPharmacist across all of its social media platforms: Twitter, Facebook, LinkedIn and Instagram. Pharmacy Times® encouraged followers to share an experience or photo that highlighted the value of the pharmacist. By using #ThankAPharmacist and tagging @Pharmacy_Times, followers were able to generate awareness and goodwill for their favorite pharmacists. Tracking posts throughout the month, Pharmacy Times® estimated its tens of thousands of social media followers posted, received or shared #ThankAPharmacist content multiple times a day. Posts to #ThankAPharmacist reached hundreds of thousands of pharmacists, peers and patients, bringing broader awareness to the profession and celebrating the value of the pharmacist. To conclude this annual initiative, Pharmacy Times®’ editorial staff monitored and reviewed #ThankAPharmacist posts during the month of October, culminating in a selection of the ten best posts to be featured in its November issue. These top ten experiences and photos best represent the value of the pharmacist and can be found in this month’s print issue. “The top ten posts featured in our November issue exemplify some of the best our U.S. pharmacists have to offer and are only a sample of the efforts our pharmacists put forth every day managing patient’s overall health. From clinical integration to patient consultation and medication therapy management, we are proud to thank, honor and celebrate our pharmacists, this and every October, for years to come,” concluded Haug. For more information on the #ThankAPharmacist campaign, visit the Pharmacy Times® website (www.pharmacytimes.com) and check out Facebook (Facebook.com/PharmacyTimes), Twitter (@Pharmacy_Times), LinkedIn (https://www.linkedin.com/company/pharmacy-times) and Instagram (pharmacytimes). Pharmacy Times® is the leading media resource for pharmacists and the pharmacy industry, providing practical clinical and professional information pharmacists can use in their everyday practices when counseling patients and interacting with other health care providers. Each issue and the website contain articles and features covering industry trends, medication errors, drug interactions, patient education, disease state management, patient counseling, product news, pharmacy law and more. Additionally, Pharmacy Times Continuing Education™ is accredited by the Accreditation Council for Pharmacy Education as a provider of continuing pharmacy education. Pharmacy Times® is part of Michael J. Hennessy Associates, Inc., a full-service health care communications company offering education, research and medical media.